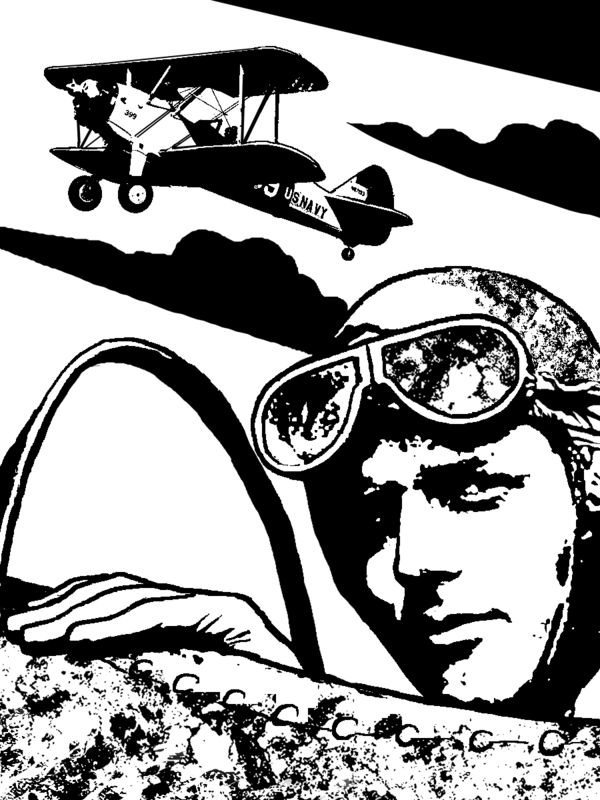 In the Pulp era, when flight is still a new and dangerous activity, the Aviator is a dashing figure of romance and derring-do — sometimes his entire life seems to be an adventure! Many Aviator stories/magazines show the characters fighting in fictional battles of the Great War, or at least have military experience to explain their aerial skills. The typical Aviator lives to fly. He feels more at home up among the clouds than with his feet on the ground, and will do nearly anything — sometimes things that aren’t entirely safe or ethical — to get back in the cockpit. He’ll fly when he’s injured or sick, sneak out of base and hijack a plane, whatever it takes! Given how dangerous flying can be, it’s no surprise that many Aviators are thrillseeking daredevils as well, ready and willing to pull an impressive stunt given the slightest encouragement. Real-world examples of Aviators include pioneering flyers Charles Lindbergh and Amelia Earhart, and World War I air aces like Baron von Richthofen (the Red Baron) and Eddie Rickenbacker. Examples from fiction include G-8 (not to mention his Battle Aces), Dusty Ayres (and his Battle Birds, of course! ), the Griffon, Tam MacTavish, Bill Barnes, Philip Strange (who also possessed psychic powers and weird skills), Smoke Wade, the Lone Eagle, Waldo Pepper, and Terence X. O’Leary. A few female pilot characters — Aviatrices such as Barbe Pivet — graced the pages of the pulps as well. A storm of criticism and censure had broken around the head of the biologist. It was charged that Carlin was caught in the act of using human beings in blasphemously revolutionary experiments[.] Carlin was dismissed from the university in disgrace. After a brief investigation, scientists branded his serum a cruel hoax, and Carlin’s name faded swiftly into oblivion. Shocked conjectures ran riotously through Kent’s startled thoughts. Was Carlin using this hidden swamp retreat to carry on human experiments even more radical and revolting than those that had sent him hurtling into professional oblivion? In our modern day world of computers, satellites, vaccines for most major diseases, and 5,782 cable channels, we tend to take science and scientists for granted in many ways. But things were a little different in the Pulp Era, when many important discoveries hadn’t yet been made and devices hadn’t been invented (or hadn’t come into common circulation yet). This made the Scientist a mysterious, even romantic, figure — and thus a perfect character for Pulp adventures, both as hero and as villain. Adding to the scientist’s cachet was the fact that in the Pulp Era, one could still make significant scientific advances as a “garage tinkerer,” without the benefit of vast resources, corporate backing, or the like. For example, John L. Baird, a Scotsman who was a pioneer in the invention of television, built the first mechanical television in 1923 with bicycle lamp lenses, a biscuit tin, a cardboard disk, knitting needles, string, and a tea chest — things he just had lying around the house. But despite this, Pulp sories usually relegated the Scientist to one of two roles: helper to the hero (rather than being the protagonist himself); or villain. Heroic Scientists — such as Dr. Zarkov, Professor Brownlee, and Dr. Huer — were skilled in a wide variety of scientific fields (including fictional ones, sometimes). They often provided advice, assistance, and gadgetry to their associated heroes (Flash Gordon, the Spider, and Buck Rogers, in this case). They also tended to get in trouble during expeditions or while conducting Weird Science experiments, and thus require rescuing. 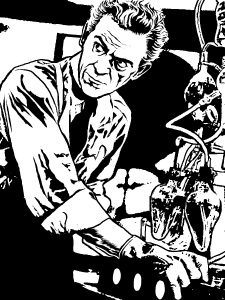 Villainous Scientists (or Mad Scientists as they’re often known) are a common figure in the “Weird Menace” subgenre of Pulp stories, and frequently appear in Crimebusting and Globetrotting Adventure tales as well. No field of scientific endeavor — biology, medicine, chemistry, physics, electronics, robotics — is beyond their twisted theorizing. They take the Scientist’s interest in scientific progress and devotion to a particular project to obsessive, even threatening, levels. A Mad Scientist’s quest for “knowledge man was not meant to know,” to prove a bizarre theory other Scientists laugh at, or to obtain something no one else has (a death ray, immortality, mind control…) lead them down villainous paths. Cruel experiments on unwilling human subjects are commonplace, as are bank robberies and scams to fund their research or kidnapping other Scientists to force them to “consult” on a project. They’re the perfect foil for noble-hearted heroes dedicated to truth, Justice, and human dignity.